Small - $49.99 Only 6 left! What does a criminal mastermind need to take over the world? Doomsday devices! And what do they need to operate their high tech doomsday devices? Minions! Ones just like in the hit animated movie Minions, and if your little one can't wait to join in on the action, she's going to have a blast in this officially licensed Minions Deluxe Jumper costume! Any kid can be a good minion if they try their best and help their master carry out their sinister schemes, but as your little one probably knows already, it takes a bit more to be a great minion. We're talking about the kind of henchman that can be counted on when things get really tough. Like, if they were trying to steal the moon, and the master needs a helper who can operate a lunar tractor beam all by themselves. Or if a jewel heist plan falls apart because someone forgot to bring a bag, and somebody needs to step up and carry all of the jewels in their hands and pockets. That is the mark of a great minion! It also helps to already look like a professional minion, too, which is what this awesome costume is made to do. This cute jumper and attached undershirt are designed to look just like the silly little helpers in the movies, and it even comes with a headpiece, rubber laboratory goggles, and three-fingered gloves to give your little one the complete look. 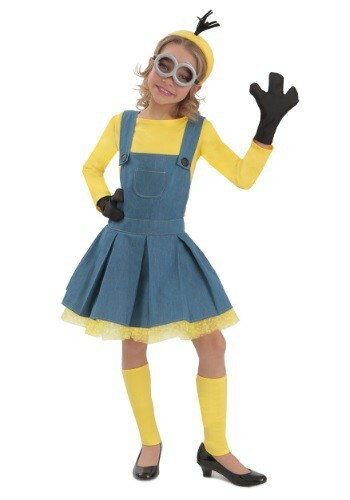 Dress the whole family up in Minion costumes so you all can take over the world together! The costume arrived a day early. I honestly didn't know what to expect. The quality is great, it doesn't feel like a cheap costume. It almost feels like actual clothes you would buy at a store. My daughter loves it. She has being wearing it all day and does not complain about it. It does not itch like other costumes. She loves it and so do I. I 100% recommend this costume over other minion girl costumes! I love this manufacture! The fit is amazaing, like a real dress. High quality at a reasonable cost. I will start to buy Princess Paradise from now on. The dress fits my daughter without my fear of requiring something underneath it for dignity reasons. Also, very happy with all the included features such as the headband, eye wear, leg warmers and hands!